The Tough Mudder event takes place in Skipton (Yorkshire) on the 2nd August 2014. The event’s main purpose is to raise money for Help The Heros. Their team are also raising money for Live Strong Cancer Charity and Fire Fighters Charity & Macmillan Cancer Charity. To date, the Transdek Trio have raised £1,445.00 towards Macmillan Cancer. As well as helping with the medical needs of people affected by cancer, Macmillan Cancer Support campaigns for better cancer care and aims to improve the lives of everyone living with cancer in the UK. 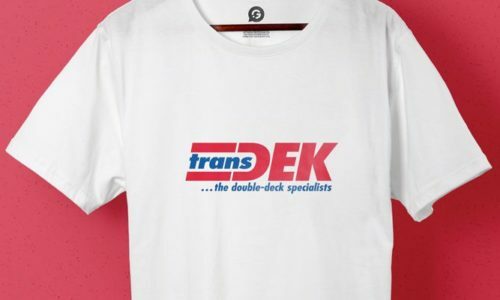 TransDEK contacted Garment Printing to create the printed running T-Shirts to fit in line with the current TransDEK T-Shirt designs. The printed T-Shirts had to carry the TransDEK logo on the front and who they were running for on the bag. For the printing, we opted to use Transfer Printing as it allowed us to quickly create the T-Shirts so that they were ready for the event. As the T-Shirts were to be used for a sporting event, we opted to use an Asics running shirt to provide maximum comfort at all times and to ensure that there was also no irritation to any of the participants in the event. The T-Shirts were produced and delivered to TransDEK ready for them to compete in the run. “Initial communication with the Garment Printing staff was excellent. The team worked with us to ensure the design of the T-Shirts fitted in with the current design of the T-Shirt. We were offered a discount due to the printing being for a Charity sports Event – Tough Mudder. We were also advised as to how else to keep the cost down by keeping the size of the logos within a certain size, and combining all logos onto one design rather than having several separate ones.